Use promotional code SAFE at checkout to get a discount on this title! "I strongly recommend this book to all persons concerned with raw processed plant grains and to agricultural and food industry libraries." 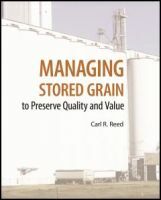 This unique book is written specifically for those in grain operations and addresses the full range of topics related to maintaining the quality of grain stored on the commercial scale. It demonstrates how science-based information can be incorporated into grain storage operations to increase efficiency and decrease the risk of grain deterioration. Written in layman’s language, it is comprehensible to every reader regardless of academic background. The focus of the book reflects the author’s many years of research experience in farm bins and grain elevators, in addition to his extensive contact with grain operations’ professionals, both on the job and in the more than one hundred storage meetings he has conducted. The text was reviewed by grain industry leaders to ensure that it speaks to the information needs of real grain handlers and by leading scientists to ensure the accuracy of the information. This book will not duplicate any book on your shelf -- it does not merely summarize the information already available to grain operations personnel. Rather, the text guides the reader to the existing publications before proceeding to information not available elsewhere. Topics covered include: grain quality factors and terminology; grain insects and molds; physical processes affecting stored grain; grain sampling and monitoring; sanitation in grain elevators; aeration management; grain dryer management; and bulk grain fumigation. This resource will be of use to grain handlers, grain storage managers, grain elevator managers, bulk handlers, and grain merchandisers. 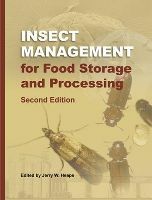 It will also be an excellent teaching tool for courses in Agricultural Systems Management, Transport and Distribution - Grain Handling, Grain Processing, Feed Manufacturing, Grain Drying & Storage Systems, Grain Storage, Flour Milling, Applied Entomology, Applied Mycology, and related areas of study. Adopt this book for your course and get special significantly reduced pricing for students. Customers inside the U.S.A. may examine the book free for 60 days with no obligation to purchase. You will receive the book along with an invoice. If you choose to keep the book, but not adopt it for your class, simply pay the invoice. If you choose to adopt the book for your class, keep the book compliments of AACC Intl. PRESS when you write "Complimentary Desk Copy" on your invoice and return it with a photocopy of your bookstore order or bookstore requisition form for 10 or more copies of the textbook. If you decide not to adopt the book for your class and you do not wish to keep the book for your personal use, simply return the book in resalable condition with a copy of your invoice and write cancel on the invoice. Click here to request a 60 day review! To get special significantly reduced pricing for students call 1.800.328.7560 in the USA and Canada or +1.651.454.7250 from international locations. You may also email aacc@scisoc.org.